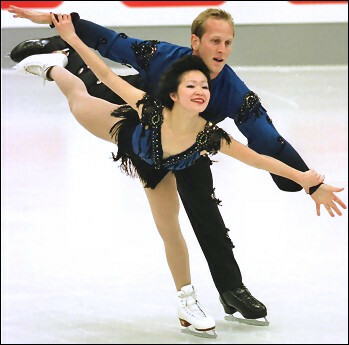 Rena Inoue and John Baldwin finished third at the 2003 U.S. Nationals and look forward to their first World appearance as a team. Some of the most successful pair teams in the U.S. have been Japanese women and American men: Kyoko Ina and Jason Dungjen; Kyoko Ina and John Zimmerman; Yuka Sato and Jason Dungjen. And the newest team: Rena Inoue and John Baldwin. The couple finished third at the 2003 U.S. Nationals, bettering last year’s fourth place finish and look forward to their first World appearance as a team. Thanks to Ina’s and Zimmerman’s bronze medal at last year’s Worlds, third place put Inoue and Baldwin on the World team. Their success at Nationals also keeps alive Baldwin’s record of 15 National appearances. He first made the team in 1986, but never cracked the top five in seniors until partnering with Inoue. In addition to their bronze medal at 2003 National’s, the skaters finished a respectable fifth both at the Bofrost Cup on Ice in Germany and the Cup of Russia at this season’s ISU Grand Prix series. “I first went to the ice rink when I was only one or two,” says Baldwin. “My parents were coaches so they took me along to the rink rather than going to a babysitter. During breaks, they would hold me up and skate me around the ice. I guess you could say I was born into it.” Baldwin began competing when he was four. He won gold medals at U. S. Nationals in both novice men and senior figures, as well five medals in junior men, but has never reached higher than ninth in seniors. Internationally, he reached the podium at Junior Worlds in 1990, finishing third, an event where he first noticed Inoue who was also there doing pairs. But the two did not meet until years later. “I was coming to the end of my singles career in 1999, but I really wanted to continue competing,” says Baldwin. “My father found Rena and convinced her to tryout with me.” In order to prepare for the tryout, Baldwin worked with coach Jill Watson, three time national pair champion and Olympic bronze medalist. Watson and Baldwin worked out for several months before the tryout with Inoue. That one tryout turned into a partnership, both on and off the ice. Inoue began skating when she was four. “I had really bad asthma,” she said. “The doctor told my mother to take me to swimming and ice skating.” The skating won out over swimming and by the age of fifteen Inoue skated in her first Olympics for Japan in both singles and pairs in 1992. Inoue made the Olympic team again in 1994 but competed in singles only. Her last singles competition was the 1998 Japanese Nationals. “I got sick and was out for a year,” she said, “so I decided to finish up my singles career. My body just couldn’t take it. I was actually ready to quit skating altogether and move on with medical school when Johnny’s dad contacted me.” Their tryout was the first for Baldwin. He never considered any other skater good enough for a tryout. After Rena, he did not try out with anyone else. Off the ice, Baldwin listens to all kinds of music, while Inoue is a fan of Gwen Stefani. For recreation, Baldwin plays tennis and golf. “I’d love to play hockey, but it’s too dangerous,” adds Baldwin. Inoue enjoys swimming and is learning tennis, but says, “I’m more of a homebody. I like reading and sewing.” She reads mysteries and history books in Japanese. Baldwin also likes to work around the house, redecorating, building things and gardening. Baldwin used to spend a lot of time on his computer. Now both skaters use their computers only for email. Inoue is a big Snoopy fan and has lots of Snoopy stuff. She also has a pet cat named Madonna. The skaters plan to skate until at least 2006. “We want to skate as long as we can stay healthy,” Baldwin says. “I think we have a good shot at winning the national championship and the Olympics are definitely a goal. Rena will be eligible for citizenship by then so hopefully the opportunity will be there for us.” “Afterwards we’d like to move on to do tours for a few years,” adds Inoue. For a career though, Inoue, who has put her medical school on hold, plans to be a pediatrician. Baldwin has been working in the wholesale car business for ten years and plans to continue unless success in skating takes him in another direction. n 1909, Ulrich Salchow (7 August 1877 – 19 April 1949) of Sweden first landed a jump in competition in which he took off on the back inside edge, and landed on the back outside edge of his other foot. This jump is now known as the “Salchow” jump in his honor. Salchow also won 10 World Championship titles before retiring from competitive skating.